A tastebud-pleasing platter, this cream cheese torta appetizer assortment from Rising Sun Farms in Southern Oregon's Rogue Valley makes the perfect party snack at your next gathering. 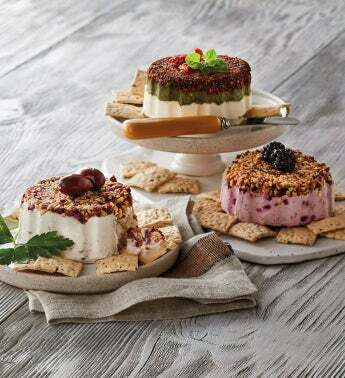 Enjoy three delectable offerings: pear Gorgonzola, marionberry, and pesto and sun-dried tomato. The savory flavors are perfect for dressing up pastas and meats, while the sweet marionberry makes an excellent addition to pancakes, waffles, and bagels. Serve any of these incredible flavors on crackers for appetizers made easy.